If you’re like most parents of newborns, there is one thing on your mind in the first few weeks after bringing a new baby home from the hospital: how to get your newborn to SLEEP! The truth is, it’s totally normal for newborns to wake every few hours to feed, and it’s also normal for newborns to take short catnaps, but there are a number of ways you can gently help your newborn sleep longer and more deeply – and that, in turn, means more sleep for you! Here are our top 10 tips to teach you how to get your newborn to sleep. 1. Develop a post-feeding routine. To help your newborn baby sort out day and night sleeping even more, you may want to develop a play routine after she eats during the day. Keep her awake 20-30 minutes (or so) after feeding by playing, singing, bathing, etc. 2. Keep your newborn’s wake-time short. Early-on, the key with your newborn is to keep wake times very short. You should look for sleepy signs and soothe your baby for sleep after just 1-2 hours of wake time TOPS. If you wait until she is fussy, cranky or crying, you are actually too late, because an overly-tired baby will have more trouble settling down, and falling (and staying) asleep. 3. Keep your newborn’s days bright and nights dark. Although you might be tempted to keep things quiet and darker for your newborn to nap well, it might prolong the day/night confusion that many newborns have. So, keep days bright and upbeat, and nights dark and boring, and it will help your newborn sort out her days and nights faster. 4. Give infant massage a try. Infant massage is an easy and natural way to help your newborn relax, which in turn can help promote better sleep. Not only that, but infant massage can improve digestion (great for colicky newborns), strengthen the mother-child bond, and even aid in growth and development! 5. Limit your newborn’s naps. If he is taking longer to sort out days and nights (or you are having a very rough time keeping up with him being up all night), you can further speed up the process by limiting any one nap to no longer than 2 hours during the day. LEARN MORE ABOUT PERSONALIZED SLEEP PLANS TODAY! 6. Try room-sharing, to make nighttime feedings easier. Sometimes it helps to have your newborn in the room with you for quick access during middle-of-the-night feedings and diaper changes. This also can help give your newborn more comfort being close by, as he will be able to hear and smell you. It’s safest to have your newborn sleep near your bed, or right next to it, in a separate bassinet. 7. Try swaddling your newborn. To help mimic the feeling of the womb, it helps to swaddle your newborn baby; this helps him feel safe and secure and also helps him stay asleep during any moro (or startle) reflex moments. Just be sure to practice safe swaddling– your baby should be able to flex his hips and breathe comfortably. Keep in mind, too, that you should stop swaddling your baby once he can roll over. 8. Cluster feed in the evening. It’s perfectly natural for newborns and young babies to ‘tank up’ on feeds in the evening, and to feed more frequently than they do during the rest of the day. In fact, many agree that newborns do this as a way to get in a longer stretch of sleep at night – many babies will sleep their longest stretch of the day after cluster feeding! 9. Use white noise during sleep times. White noise not only masks those pesky noises in your home that can wake the baby (like the doorbell ringing, the dog barking, etc. ); it can also mimic the ‘white noise’ your newborn heard in the womb. In fact, some white noise machines even come with a ‘heartbeat’ setting, which many newborns respond well to. Nothing is more soothing for baby than being held close to mom or dad. Consequently, most newborns sleep best when they are in mom’s or dad’s arms, or held snugly in a baby sling. This is especially true for colicky babies – baby wearing is a great way to soothe colic! Now, some of these tips can create bad habits to change later, but during the first weeks, you really do what you can to survive. For more tips about how you can help your newborn sleep well – and to learn some key secrets that will help you build a healthy sleep foundation for your baby right from the start – download my free e-book, 15 Baby Sleep Facts New Parents Need To Know. It’s 100% free, available instantly, and will get you started on the path to better sleep for your whole family (your newborn included!). 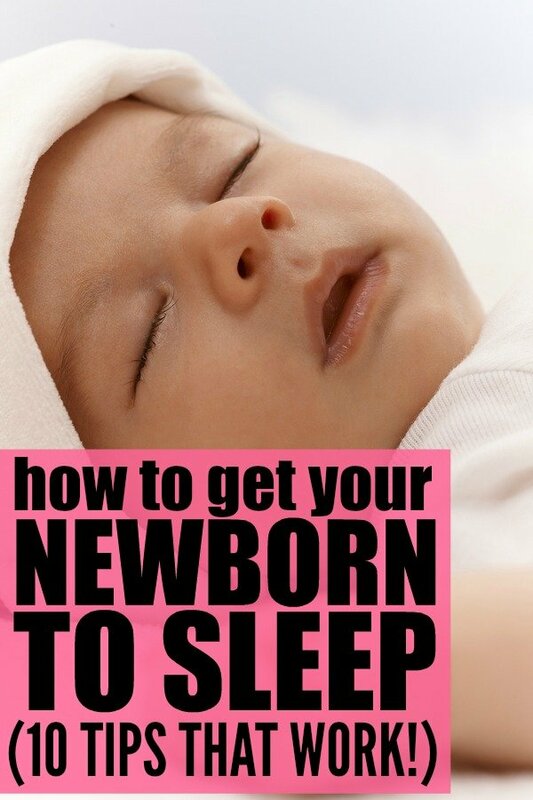 If you found these tips to get your newborn to sleep, please share them on Pinterest! And if you’re looking for more sleep advice, please follow our Sleeping Children board where we share all kinds of fabulous tips and tricks!